Rest and Recovery - Why you need it. "Rest and Recovery day is not for me." YOU KNOW WHO YOU ARE! During this period your body begins to adapt to the stresses of exercise by repairing damaged tissue and replenishing energy stores (glycogen). 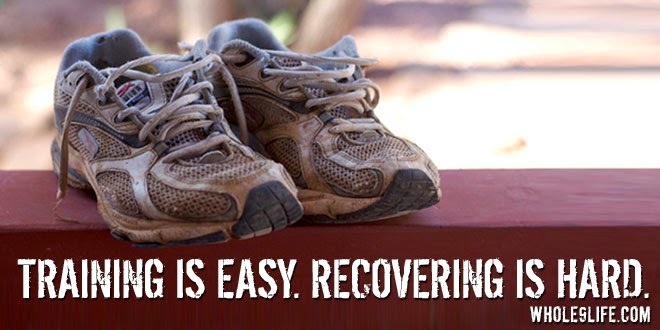 Without recovery muscles continue to break down eventually leading to overtraining. Active recovery means you allow your body to heal while still engaging in light activities. It does not mean "do nothing" at all. Light activities can range from Yoga to short light jog, swimming or biking, dancing or playing ball with the kids. This is also a time when you replenish fluids and optimize metabolism of protein which allows muscles to become stronger as they heal. Long term recovery refers mainly to sleep. Disconnect at the end of the day and change your routine if you must but put sleep at the top of your long term recovery schedule. Sleep deprivation has been linked with decreased aerobic endurance and increased levels of cortisol. Then there are those mood changes and fatigue. Your body can only tolerate so much stress before it starts to break down. There is a balance to getting and/or staying in good physical health -- too much, too quick without recovery leads to injury, too little and you will see no results. Exercise is supposed to improve mood, give you a sense of accomplishment and leave you happy and glowing. If you don't ever feel good immediately after and in the hours that follow a good workout then you might already be experiencing the symptoms of overtraining. Rate yourself... are you experiencing some of these symptoms? Let's talk about this and what you can do to avoid overtraining.